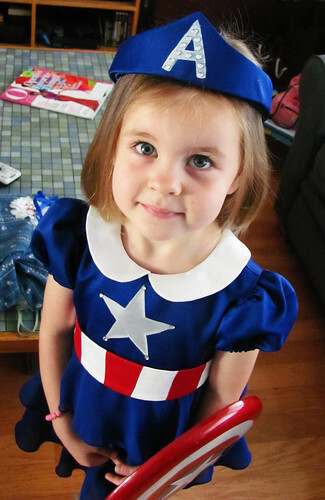 Tiny Princess Captain America is based off of two commercial patterns: Butterick 4967 for the main dress, and Butterick 4054 for the sleeves. The 4054 sleeves fit right on without any issues, and because they're gathered, they're very forgiving of any minor size differences. One thing to note is that 4054 only goes up to a size 4, while 4967 goes up to a size 7. So if you want to make it in one of the larger sizes, you'll either have to grade up the sleeves or find a different puffed sleeve pattern to use. 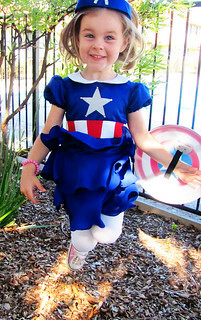 Except for the skirt tiers, all of the outer fabric is Casa Satin from Jo-Ann fabrics (left over from my Captain America USO girl! 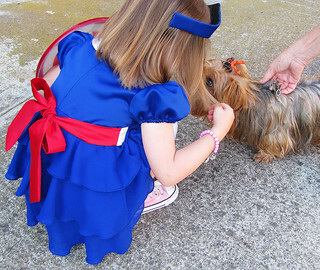 ), and the bodice and skirt are lined with the matching Casa lining. The skirt tiers are a poly georgette. 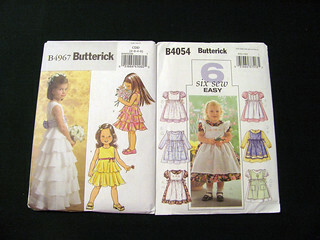 If you use Butterick 4967, I strongly recommend a georgette or crepe for the skirt tiers. Chiffon is too thin, and the satin is just too stiff. 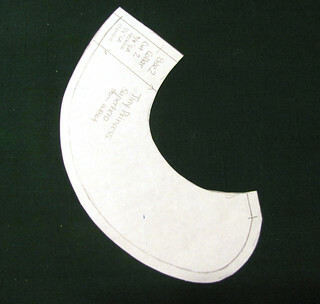 The Peter Pan collar is drafted straight off of the bodice pattern, which is not very difficult at all. 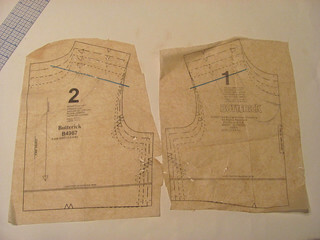 First, draw a line 5/8" down from the edge of the shoulder on both the front and back bodice. This is the seam line. Next, match up the front and back pieces at the shoulder seam line. It's easiest to fold one of the pieces back and place it on top of the other piece. Now you can draw your collar on! 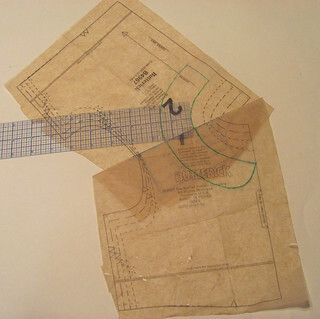 Drawing a seamline 5/8" in at the neckline and center back will help you size your collar properly (otherwise the seam allowance can make you think your collar is too wide). I decided that a 1.5" collar looked best with my size 2 bodice, so I measured out 1.5" from the neck seamline all the way around, and then rounded it at the center front. I ended up lowering the neck just a little bit at the center front as well. 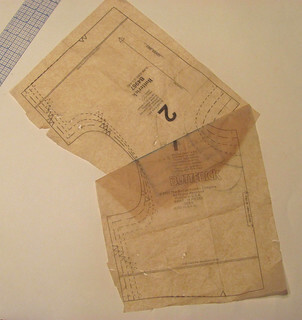 Use a piece of tracing paper to trace over your completed collar piece, then add seam allowances. I didn't have any tracing paper at the time, so I used a wheel to trace it onto some white paper instead. I used 1/4" seam allowances for most of the collar to reduce bulk, but left a 5/8" seam allowance at the neck. After I finished the collar, I attached it by sandwiching it between the bodice and bodice lining when I sewed the neck seam. Then, after clipping and pressing, I understitched the seam allowances to the lining, which helped the collar sit properly. The star is made of silver satin. After figuring out the correct size, I used Steam-a-Seam Lite to fuse it on, then went around the edges with a closely spaced zigzag stitch. Silver fabric paint would also work really well. I glued rhinestones to the points of the star with Gem-Tac, meant for gluing jewels and beads to fabric. The front of the belt is patterned the same way as the collar-- measure your seamlines first by tracing 5/8" from the bottom and side edges of the bodice front pattern, then draw on a belt shape that you like. If you want to make red and white stripes, draw on those seamlines as well. Trace your belt, then cut the pieces apart and add seam allowances. For the belt ties, I made tubes of fabric and sewed them to the edges of the belt front, and then I tacked the belt to the dress at the side seams. The tiara is made of fun foam, covered with blue satin. I wrapped the satin around to the back and glued it down, then covered the back with a piece of felt cut to the shape of the tiara. Then I painted on the "A" with white fabric paint and added some clear rhinestones. I glued the tiara to a headband form with little combs at the ends, but it would work just as well to attach a piece of elastic to the ends of the tiara and keep it on that way. See you next time, Midgardians! very cute and very amazing! 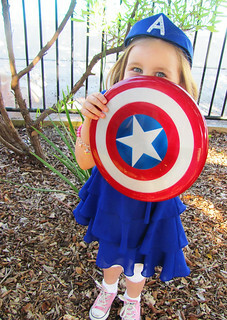 i think i might adapt it to make some other hero dress for my niece (i'm thinking either Iron Man to follow suit, or Wonder Woman because my first present to her, on Christmas after she was born, was a Wonder Woman plushie). 1. did you do the shield or did you buy it? 2. why didn't you put little wings on the tiara? 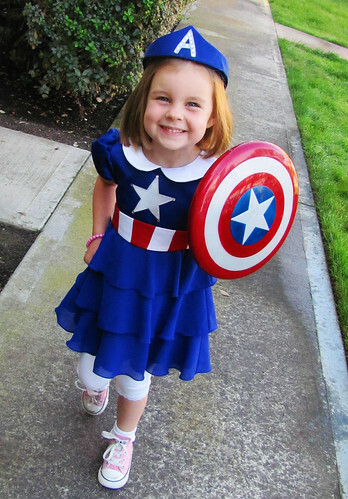 that would be perfect to cap off the costume! Thank you so much! If you end up making a dress like this, I'd love to see it! 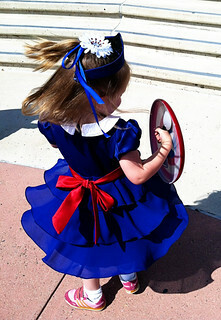 I actually made a Wonder Woman dress using the same pattern for another friend's daughter, but I don't have any good pictures of it. This is adorable. 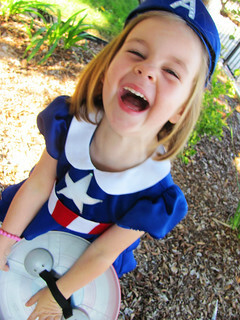 I'm sort of hoping to find a simple Green Lantern costume to make for my four year old-going on five. But this? I could try this. Thank you so much! If you do make the Green Lantern dress, I would love to see it! My 5 year old daughter saw this on Pintrest and fell in love. I'm doing a version of this idea for her for Halloween. Thanks for sharing! Very pretty and looking very sweet thanks for share. 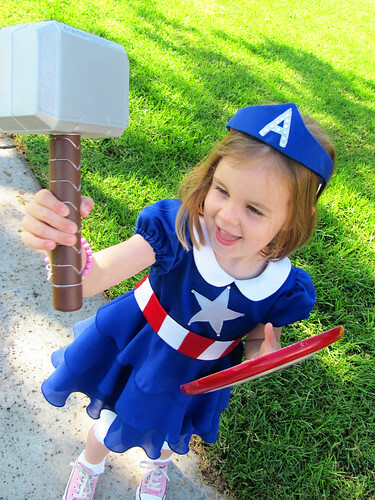 we have leather staff of captain America .